Dog grooming courses online can offer many benefits that traditional classes do not, but how can you find the best ones? A quick search of the Internet will reveal many different sites that offer dog grooming tips and advice, but how can you be sure you are getting instruction in grooming that is accurate? The best way to do this is to research the available dog grooming courses to make sure that they are legitimate and offer sound grooming advice and instruction. In addition to skin and hair care for your dog any course should include advice on how to help your dog enjoy the grooming, so that it is easier to do and benefits your pet emotionally as well as physically. One of the top dog grooming school websites is JKL Training Academy, a name known and trusted in grooming. In addition to online dog grooming courses you can find instructional DVDs and other information on this subject. Nash Academy is another online site that offers popular and effective courses in pet grooming. You will also find dog grooming supplies for sale and information to answer any grooming questions you may have. The International Academy Of Pet Design is another online provider that offers instruction and information which can very helpful. The best dog grooming courses online are the ones that allow you to work at your own pace, and which are easy to understand and clear in the instructions and concepts given. The course should include dog grooming games and other methods to help your pet enjoy the experience. Grooming should not be a chore, but instead a bonding experience that both you and your pet enjoy. 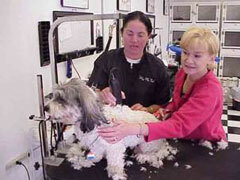 Any quality course on grooming will emphasize the comfort of the dog during the process, as well as the final result. Choosing online courses also allows you the convenience of learning from anywhere, so you can fit these classes in no matter what your schedule may be like.